It’s hard for us to imagine now, but pilots of the early twentieth century used to navigate the lands and seas entirely by sight. Night flying, or travelling through thick fog, was out of the question under normal circumstances, and extremely dangerous for those times when it was required. The first thirty years of aviation history developed without any real-time means for tracking their comings or goings, with land based observers doing their best through binoculars and crossed fingers. With the rise of Adolph Hitler in the early 1930s, the British became more than a little antsy about the prospect of aerial invasions. The English Channel had proven an effective barrier from mainland Europe for centuries, but new planes and zeppelins made it possible to attack the tiny island with brutal force in short order. An early warning system became a top priority for military researchers of the day. While the first low-tech efforts might seem comical now, it was not long before they turned to radio systems as a possible solution to their problems. Radio transmitters had already been in use for over a decade, and much of the theory was well established. Indeed, some astute observers had noticed an interesting phenomenon; radio signals reflected off of a wide variety of materials, and could then be detected at the point of origin. A high energy electromagnetic pulse would return a smaller pulse. And because radio waves travel at a constant speed, it is possible to determine an approximate distance to an object. This is the basic theory of RADAR systems, an acronym for Radio Detection and Ranging. 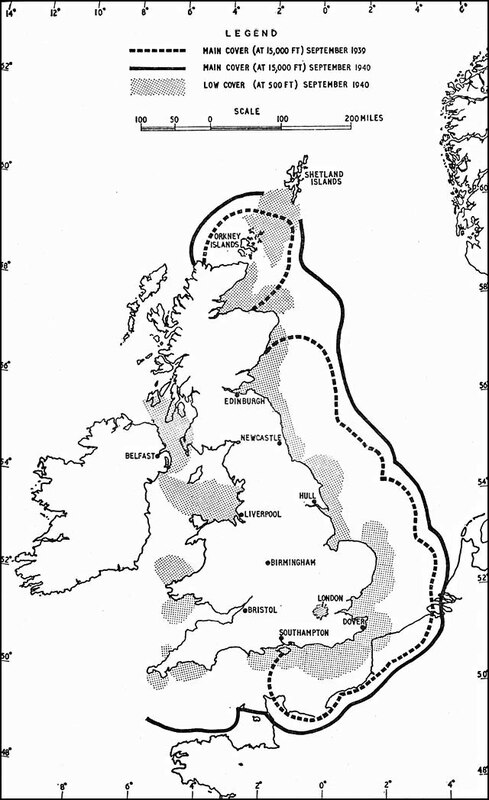 The first RADAR system used by the British comprised 21 stations placed along the country’s eastern coast. Called Chain Home, it was specifically designed to use readily available radio technologies in novel ways. Enormous antennae were required in order to emit and receive signals at the relatively low frequencies used. Though the footprint of each station was quite wide, its range was a good 120 miles, which allowed the Brits to observe generalized activity across the Channel and scramble to avert oncoming attacks. Chain Home stations had no direct communications with pilots, however, and relayed all information via land lines to a central command station. Central command interpreted the incoming data from each station to get an overall view of the situation, and radioed pilots as needed. Chain Home was never more than an early warning system, and could not be used for offensive manoeuvers. As the technology advanced, ingenious methods were devised that allowed pilots to respond in real time to RADAR transmissions from ground stations back home. These systems were primarily used for bombing German territories during night-time raids. The Second World War saw RADAR systems develop at a phenomenal pace. Each new generation was accompanied not only by an increase in precision and accuracy, but a reduction in physical scale. It was a British invention, the resonant cavity magnetron, which allowed RADAR equipment to become portable enough to be installed directly on the planes themselves. The first RADAR system to be installed on a plane was the H2S, affectionately called Home Sweet Home. From the vantage point of a flying fortress, it became possible to take full advantage of all reflected signals from a RADAR pulse. Some surfaces, like the flat waters of lakes and rivers, reflect signals away from the source. Structures with largely uniform and highly angular surfaces, like bridges or buildings, reflect the signals back to the source in distinct patterns, which make them very easy to identify on a RADAR screen. Everything else falls in between. By scanning the ground in front, behind and directly below the plane, the H2S allowed the air crew to see, for the first time freed from line-of-sight navigation, everything they needed to perform their duties. Shortly after the introduction of the H2S in January 1943, the Germans captured one of the bombers with the system installed. Upon discovery that Allied technologies had finally overtaken that of the Axis, Hitler flew into one of his famous rants. It took months for the Axis to reverse engineer the H2S and come up with one they could install in their own planes, providing a significant advantage to the Allies. As the Germans toiled away, Americans modified the system to triple the H2S RADAR frequency. Officially dubbed the H2X, the new system remained beyond Axis RADAR sensing technology for the duration of the war, and gave the Allies a permanent upper hand. That said, the H2X was hardly a perfect system. Skilled technicians were required to interpret the highly distorted display, most especially for items less than 5 miles away from the plane. 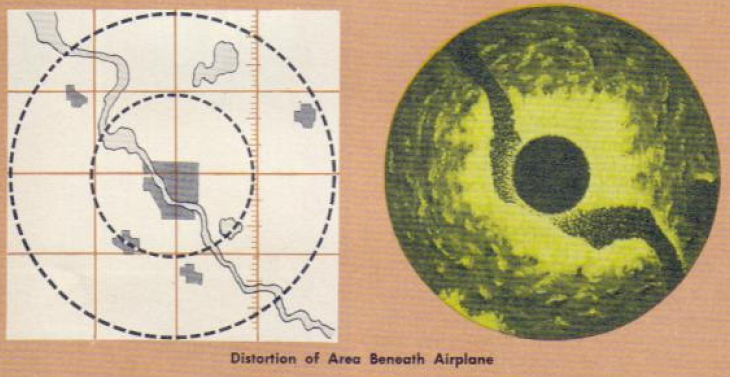 The narrow RADAR beams were installed on rotating platforms in the plane, and as the antennae swept over their full range, the elongation and compression of the images made for a very challenging read. Today’s RADAR and GPS systems perform acrobatics in calculation that correct for such inconsistencies, which at the time all had to be done by hand. While most of us today tend to think of the atomic bomb as being the greatest technological feat, the capstone of the World War II era, RADAR played a much longer, and much more elaborate role. RADAR is credited as the primary reason that Britain was able to defend herself as well as she did in the first two years of the war. And while nuclear weapons technology flourished in its way throughout the Cold War, RADAR has come to affect our lives in much more mundane ways via weather monitoring stations, vehicle guidance systems, ground penetrating RADAR for locating dinosaur bones and oil deposits, outer space surveillance, and so on ad astra. This entry was posted in art, close to home, education, history, science. Bookmark the permalink.